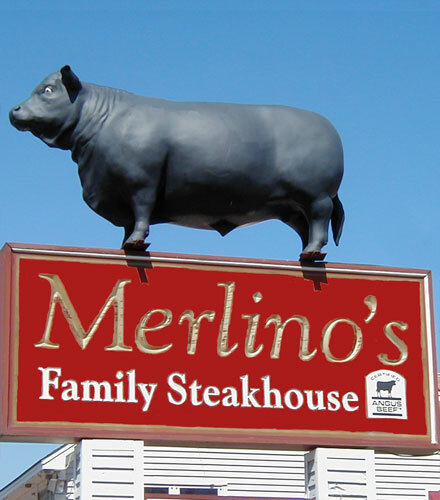 Merlino’s Steakhouse a family steakhouse, featuring the best beef money can buy, Signature Angus Beef. We also specialize in Italian Cuisine, Seafood and fresh Maine Lobster. In addition, we offer a comfortable pub to enjoy your favorite sporting event or to just relax with friends. We are Family friendly with a large children’s menu. Merlino’s has been owned and operated by the Luciano family for over 49 years. Open daily at 11:00 for lunch and dinner. We offer an extensive wine and cold beer list with local beers on tap. Please join us to share friendly conversation or your favorite sporting event on our 4 big screen TVs.